While I may not like to admit it, I love purses. Some women obsess over shoes, but for me, a good purse is like a girl's best friend. When I purchase a purse, it usually goes with a specific outfit, season, or fits a need in my life. For example, I have some purses that I purchased just for carrying books when I'm traveling. 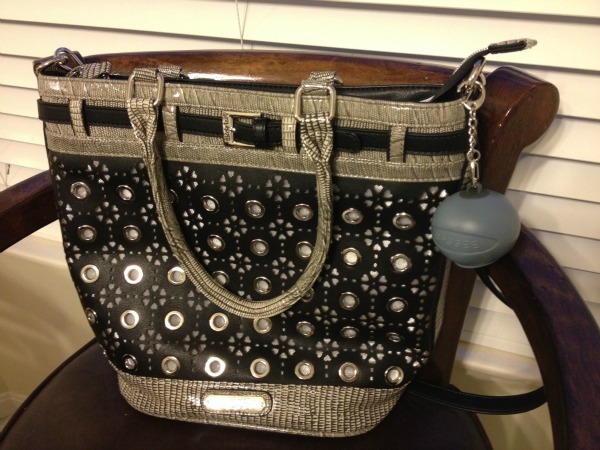 When I found out I was going to have an opportunity to review a Nicole Lee purse – I was very excited! I had seen their purses featured on quite a few blogs and outfit pairing pins on Pinterest. Even better, I was getting an opportunity to review one of the new purses from their Spring Collection – The Suzy's Delilah Heart & Eyelet Tote. For our readers who haven't heard about Nicole Lee – they are an LA based purse company that started in 2004 and makes unique, fashionable bags known to start fashion trends. Rather than copy what other designers are doing, they design purses that incorporate modern culture and social traits into their designs – giving us ladies purses we love! These high end contemporary bags are perfect for modern, busy women like us! As for the interior of the Suzy's Delilah Heart & Eyelet Tote, it is lined with a beautiful geometric satin lining, resembling stars or flowers. This bold color can be seen through the eyelet – giving it a very eyecatching and fun look when carrying the purse. Of course, the inside of the purse is all about functionality too. The purse has a pair of open wall pockets on the interior front, and another well-sized, zip wall pocket on the interior rear wall that bears the Nicole Lee name plate. To see more of the Suzy's Delilah Heart & Eyelet Tote – feel free to check out my video review below. As a busy woman who is often on the go and travels quite a bit – I demand that my purses be functional and fashionable. I'm not one of those people who buy ugly purses with no personality. A good, everyday purse should carry everything I could possibly need and look good doing it. My purse, in many cases, is a survival kit if a client calls me when traveling or someone around me needs something. It's very common to find pens, my iPhone, wallet, makeup, a first aid kit, chapstick, a paperback book, and more in my purse. For me, the Suzy's Delilah Heart & Eyelet Tote does a great job filling all of my needs. I can fit everything from my old purse in the Delilah and still have room to spare. 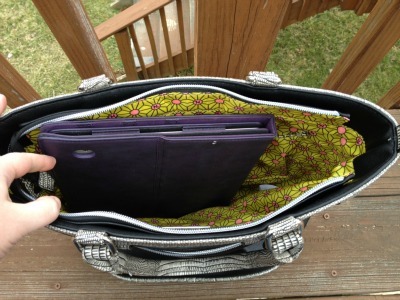 For the first time, I even have a purse that can fit my iPad 2 and not be strained! Along with fitting my iPad, I enjoy the fact that this tote actually has a top zipper closure. I love tote purses, but quite a few of the totes on the market have no zipper. As some of you know from reading some of my other reviews, I am a klutz. If I don't have a top zipper, everything in my purse will eventually go flying. My worst fear is dropping my purse and seeing my iPad or iPhone fly out, cracking the screen. The zipper gives my personal things some Susan protection! Also, I love the two interior pockets in this purse. One is the perfect size for a wallet or checkbook, while the other gives my iPhone a nice home. Nothing is better than being able to open my purse if my phone goes off and quickly find it! From my experience, the Suzy's Delilah Heart & Eyelet Tote is truly designed for modern women like me! Another thing I love about the Suzy's Delilah Heart & Eyelet Tote is that it is an everyday purse and goes perfect with just about everything. It goes great with jeans and a t-shirt, or a nice light sweater coat. My favorite choice of outfits with this purse is a dark pair of blue jeans, lacy shirt, and sweater coat. If I don't feel like wearing an oversized sweater, I compliment it with a nice leather coat. For me, this is the best part of having a fun black purse – it really does go with just about any casual outfit. If you are looking for a fun purse that looks fashionable and is great for everyday use – I highly recommend the Suzy's Delilah Heart & Eyelet Tote. From my own experience, I don't think I can say enough about the Suzy's Delilah Heart & Eyelet Tote. It is by far my favorite purse at the moment and goes with most of my everyday outfit. Best of all, it can carry just about anything I want, making it perfect for a trip grocery shopping or an out of town excursion. I'll also admit it's nice having everyone compliment my new purse or ask where I purchased it when I'm out shopping. Based on my own experience, the Nicole Lee Suzy's Delilah Heart & Eyelet Tote gets an A+ rating – no question about it. There is nothing I would change about this purse. Would you love to own the Suzy's Delilah Heart & Eyelet Tote yourself or look at Nicole Lee's other amazing purses and handbags? You can purchase this purse the Suzy's Delilah Heart & Eyelet Tote product page or look at the rest of their collection at the Nicole Lee website. At the time of this review, this purse was available in four colors – black, blue (turquoise), white (bone), and red. 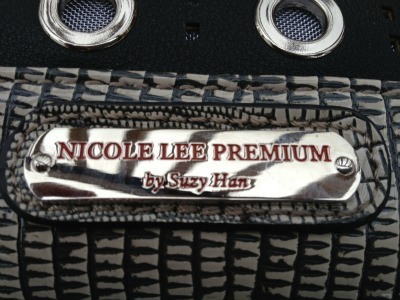 We are also very happy to announce that Nicole Lee is giving an exclusive discount on their purses to our readers! 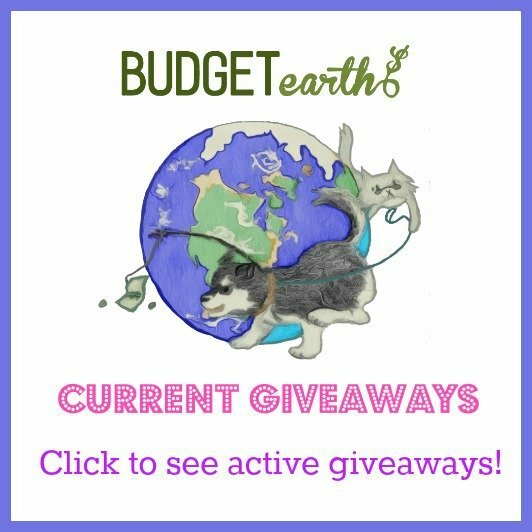 From March 15 – March 25, you can use the coupon code BUDGETEARTH15 to get an amazing discount on one of their purses! Disclosure: Budget Earth did not receive monetary compensation for this review and giveaway, but did receive the Nicole Lee Suzy's Delilah Heart & Eyelet Tote for review purposes via Tomoson.com. All of the opinions on this blog are the opinions of said author and these opinions may differ from your own. Oh, pretty purse! Great job on the review & video Susan! 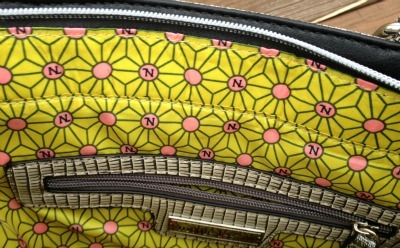 I really love the inside lining of the purse, it looks fun! Whay an awesome purse! Especially the inside! Great video, too! Thanks! The video was a bit different for me but I enjoyed it! The purse looks awesome! I love the video review-great job! Thanks Melinda! I really love this purse. It is too cute and goes with everything! Oh yes! It’s perfect all types of stuff! I so far haven’t even filled it and my purse is usually jammed pack! Cute. And I really like the bold print cloth of the interior. Yes, the bold colors are really pretty! The first time I went out with it and put it down I was surprised that you culd see it through the eyelet. It gives a really pretty look! Huh that's different! I don't think I've seen a purse with so many eyelets like that, very neat! I LOVE the inside of that purse! It's really fun. The style is a little more deep than I generally prefer, but it looks like it is really functional. I'm going to check out their other styles and see what they've got. Cute! This is a lovely bag, thanks for sharing with us! I am totally in love with this purse! It's so different and that is what I like about it. That was my thought too! It’s bold, feminine and most important – useful! I'm not a purse kind of gal, but I love tote bags and this one looks great!! Really great tote, I need a new one for summer. Thanks for the review! I love my L.A Based Companys! I Love The Details On The Bag Too Very Pretty. This is really pretty purse, but not just a pretty purse, but I could put so many of my important items in this Tote. I like the size and color shown. Great tote that I would love to own! This tote is adorable! I love the lining too. Much more fun then some brands. I can't decided between the black or the blue! That was the same issue I had! The blue is a really pretty color but I’m worried it would be limited to only spring. This is adorable. And I love the size! I really like the looks of the bag. I am excitd to know that ist lso has pockets to organize with. it sounds like a great all around hand bag. I lvoe the way this looks. It seems awesome. Except that I don't like the size. It seems a bit too large for me. Definitely a nice purse and very roomy. it would be great for all the stuff i need on the go! I love this purse! It's hard to find good quality purses that are cute! Looks like a great quality handbag! Love the design! The purse is awesome, it looks roomy enough to carry all my 'stuff' and I love the hardware too. This bag is wonderful. It would be great to have one with this much room. What a beautiful bag! My other has been toting around the same, now frumpy, Vera Bradley bag for at least 7 years, so I can get her this one for Mothers' Day! I love Nicole Lee’s bags! They are so pretty and since this review their prices have drasticly decreased. That is beautiful, I really like the bright fabric on the inside. how cute is that bag ?!?! I am not a huge fan of purses, per se, but do love tote-style bags as I want to put everything I buy in one bag. This looks like it would perfect for me!